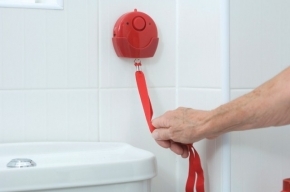 Re-attach the ripcord or switch off the unit to silence the alarm. A battery test button and indicator light is located on the front. Includes wall bracket, 2 x AAA batteries (fitted), 3 x fixing screws and wall plugs.